There are a lot of similarities behind social networks, but even when they offer similar feature sets, the way in which you use those tools varies from one platform to the next. This is especially true of hashtags. Although they’re implemented at the same basic level — to organize data — every social platform has a different vision for how they’re used. Hashtags on Pinterest, for instance, are only clickable in Pin descriptions. And unlike Twitter or Facebook, they aren’t searchable on the platform. But that’s not to say that hashtags can’t be used on Pinterest at all. It just means that marketers need to be more strategic in their implementation. One area in which marketers have successfully used hashtags on Pinterest is contests. Before you start dropping hashtags into Pins, let’s take a closer look at how you can set your Pinterest campaign up for success. The first thing to bear in mind on Pinterest is that hashtags aren’t clickable in board titles, board descriptions, account descriptions, or profile names. Hashtags are only clickable and searchable in Pin descriptions, and they work differently than they do on Twitter, Instagram, or Facebook. For example, clicking on a hashtag in a Pin’s description will not only display Pins that include the hashtag, but also those that include the same word or phrase in the description. This means that if you use the hashtag #socialmedia, Pins with the same hashtag, words, or phrase in their descriptions will also appear in search results — even if separated by a space or hyphen. It’s also worth noting that sometimes clicking on a particular hashtag will result in Pins that don’t include those keywords at all. This is because the keywords are present in the link attached to the Pin rather than the description. If the URL tied to the Pin has “social media” in it, then it’s fair game when it comes to #socialmedia search results. Keep that in mind when you’re naming your images, blog posts, and product pages. Even if you don’t plan to Pin them, that doesn’t mean your customers won’t. And if you really want to stand out, avoid using common search terms altogether. Hashtags are most powerful on Pinterest when they’re unique. Create a one-of-a-kind hashtag that, when clicked, will lead Pinners back to your content. Contests on Pinterest can range from extremely simple to sophisticated. For example, fashion site Chicwish ran a competition that asked followers to create a Pinboard called “ChicWish List” and fill it with items from its website. Every Pin also had to include the hashtag #Chicwish. Although less than 20 branded Pinboards still exist today, some feature more than 100 Pins. Assuming those Pins were liked and repinned, this simple contest turned out to be a great awareness-building campaign. Another fantastic example is ModCloth’s “Something ModCloth, Something You” contest. Capitalizing on Pinterest’s affinity for weddings and fashion, ModCloth launched a contest designed to capture the attention of power Pinners while promoting its 2012 Spring Wedding campaign. 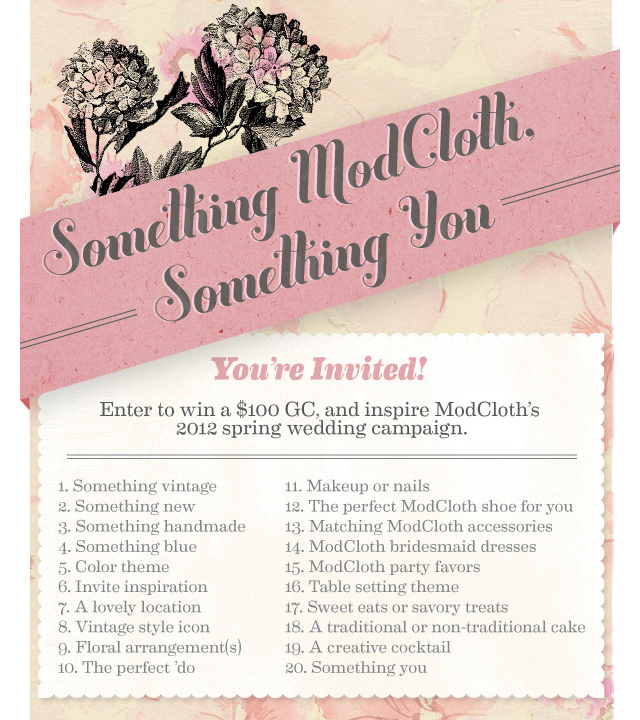 Participants were required to create a Pinboard called “Spring ModCloth Wedding,” and run through the brand’s themed scavenger hunt. In each Pin’s caption, participants had to include the number and name that the Pin corresponded to, as well as the hashtags #modcloth and #wedding. This strategy worked on two levels: brand recognition and discovery. Now anyone searching for either the brand or wedding inspiration on Pinterest would stumble upon the contest. Even if the contest had ended, searchers would still find relevant content. The campaign resulted in more than 100 boards created featuring, on average, around 20 Pins each. Some boards included far more than required, crossing over into the triple digits. As with any social platform, we don’t recommend using hashtags as the only way of tracking brand mentions or measuring sentiment. Business accounts have access to new analytics that can help guide your campaigns. Although there aren’t any rules explicitly in place regarding hashtags, Pinterest has developed several contest guidelines that you must follow. We recommend reviewing these Do’s and Don’ts in the very early planning stages of your contest. Review Pinterest’s branding guidelines if you’re going to reference Pinterest in promotional materials. Suggest that Pinterest sponsors or endorses the brand or contest. Require people to add pins from a selection. Make people Pin your contest rules. Run a sweepstakes where each Pin, board, like, or follow represents an entry. Require a minimum number of Pins. Although Pinterest’s branding guidelines don’t offer much explanation around why these are considered “Don’ts,” it’s fair to assume that they’re in place to preserve user experience. In a 2013 post on Pinterest’s Business Blog, the company emphasized that businesses are most successful when they encourage people to share content that represents their authentic interests. Requiring participants to meet a certain number of Pins or add Pins from a selection diminishes the authenticity of user-generated content. Not only can this effect the outcome of your contest, but the overall success of your Pinterest strategy as well. Focus rather on creating a genuinely engaging campaign, not manipulating Pinners into sharing your content. Whether you’re gathering user-generated content or just having fun and rewarding your audience, contests have become somewhat of a staple in marketers’ outreach strategies. But before you start handing out prizes, you need to make sure your campaign is set up for success. If you have questions about the above tips, or need additional help, visit Pinterest’s Help Center.